Yesterday I went to Best Buy to check out Otter Box cases. I already owned a commuter case and I decided I want to buy another one. If you look at the picture above the case on the right was the one I already had. The plastic somehow got warped even after I rarely used it. Probably stepped on it or maybe I brought it with me and never used it and got warped by all the stuff I carry around with me. Whatever the case may be I decided that it was time for another even if at Best Buy they charge $5 for a case than would be charged at the Otter Box website. The case on the left was the one purchase. 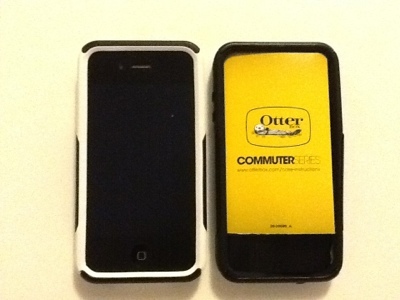 I'm pretty sure it had to have been a return and would be very surprised Otter Box shipped this product to a store. Also it had two screen protectors with it as well although I already have my own screen protector so that's not an issue. In any case when this one caught my eye it was worth buying. Hopefully the white silicone would rarely be used even though I had two events to attend that very night so white on black would be the case of choice. Otherwise it would be black on black especially since a good black piece of plastic is now in my possession. You know, with the old black piece of plastic it would be cool to play with. Just to possibly experiment with say painting it in the coloring of my choice and possibly drawing a design onto it. It might just be cool to play with some ideas!